The premise is that the dungeon complex was a weapons research facility of a long lost ancient empire, run by the daughter of the emperor. There was a magical accident and it killed everyone inside. Rather than the ancient empire using raise dead (which in B/X can be cast by a 7th level Cleric) or reincarnation or anything that you'd think an empire would have, they just buried her. But they did re-animate some of the dead in the complex to serve as guardians. Beyond that, they also buried the warrior princess with her magic sword. She really, really loved her magic sword. The sword plays a big role in the adventure, because the party finds it in the first room. While not exceptionally powerful (basically just a +3 sword), it's not exactly shabby either so they will probably keep it. Which angers the spirit of the warrior princess, who will them constantly haunt the party while they explore the complex. This sort of thing was used in the rather dreadful Cursed Chateau from James Maliewzski. Here it's much more tailored to the dungeon, while there is a random aspect to it, the effects also vary depending on what room of the complex the party is it. And if they decided to leave the dungeon with the sort, she will continue haunting them. So basically the PCs have two options, find her resting place and restore the sowrd, or find it and kill her undead form. The dungeon is well designed. While the party could actually take a direct path right to the warrior princess's tomb, they can explore in other directions as well, it's quite non-linear. 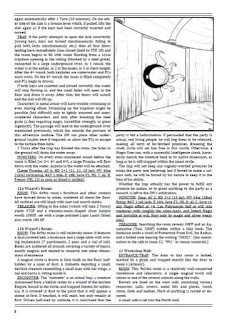 There are about ten combat encounters, though some can be avoided by quickly leaving the room, the monster won't follow. There is one major trap room, mentioned in the product blurb, a room that locks and fills with water (and piranha). The idea seems good, but it's explained by apparently there being an underground river flowing over the ceiling. While it's been 25 years since I took any geology classes, I suspect that an underground river being above a place would have some rather annoying effects on a complex below it and I'm a bit skeptical you'd find piranha in one. The layout isn't fancy by modern standards, but better than most OSR works. I'd say mid '80s TSR quality, but with two column text instead of three. The font is small, but not too small. There are a handful of pictures, either of dungeon features or items, and all seem original and are well done. While the English is excellent, now and again there are odd phrasings that make sense, but not something a native English speaker would say or write. The loot is not overwhelming (and fittingly so, since B/X needs much less xp to level than AD&D) but there are a number of magic items the party can get if they are smart enough to finish the enchanting process that was interrupted when the complex suffered its disaster. These aren't particularly powerful, but could be useful. 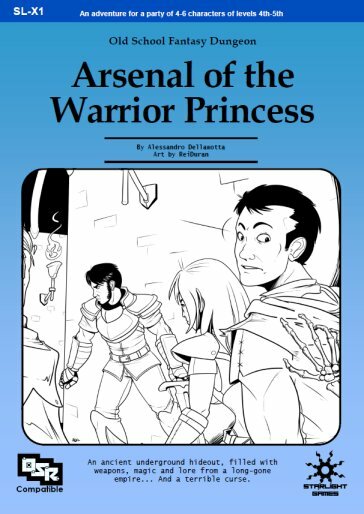 Arsenal of the Warrior Princess is an excellent module. Putting aside the logic problem of the empire not simply raising the princess, it's got a pretty good premise. The players can opt to take the sword and kill her, or be nice and lose a sword, but perhaps gain a useful resource. The dungeon is not overly challenging, but requires a modicum of sense and rewards players who are paying attention. The only real weakness is there aren't really any new monsters. But at $1.99, it's hard to complain about that.